(Long Beach, Calif.) July 5, 2017 – The second start of the 2017 Transpac Race went off beautifully in light winds off Pt. Fermin in Long Beach today at 1 p.m. PST. Sixteen boats in classes 3 and 4 started today to head west towards the finish 2,225 miles away at Diamond Head in Honolulu. In the first start, seventeen yachts in three divisions set off this past Monday in the first wave of three starts in the 49th edition of the biennial Transpac Race. You can track the race at 2017.transpacyc.com in an online tracking system utilizing transponders on each boat. It does include a four-hour delay to give no competitors an advantage. And of course the race is also the beginning of an adventure of many days and even weeks of sailing ahead, where crew camaraderie, seamanship, navigation, strategy and other skills will be tested. The best in each division will be rewarded with trophies and prizes at the end of the race, but even those who do not fare well will be rewarded with the satisfaction of having completed one of the world’s oldest and greatest ocean races. The final start of the 2017 Transpac Race is schedule for a 12:55 p.m. PST warning signal. Classes 0, 1 and 2 are scheduled to start tomorrow. Lots of sailing activities are available to the public throughout Transpac as the first boats to finish are expected early next week, possibly Monday, July 10. If you would like to become involved as a race volunteer or attend one of the many parties open to the public at the three supporting yacht clubs (Hawaii, Waikiki, Kaneohe), please contact PR Chair Janet M. Scheffer at 808-521-1160. Monday (July 3), dozens of boats will make the 2,225-mile journey from Point Fermin in Los Angeles to Diamond Head in the 49th biennial Transpacific Yacht Race, more commonly known as Transpac. There are currently 55 monohull and multihull entries from the U.S., Japan, Australia, Norway, Italy, Canada, Peru, England and Russia, ranging in size from 33 to 100 feet. There will be three separate waves that start Monday, Wednesday and Thursday. Wheeler said that Manouch Moshayedi’s 100-foot, fixed keel Rio 100 is back to defend and break her 2015 Barn Door Trophy victory for the first to finish monohull to cross the Diamond Head buoy. He added that the current multihull course record is also expected to be broken by contenders that include Lloyd Thornburg’s Phaedo3 and H L Enloe’s ORMA60 Mighty Merloe, among others. The bulk of the rest of the fleet will be competing for corrected time trophies in their classes. Transpac was originally inspired by King David Kalakaua to initiate the islands’ economic and cultural ties to the mainland. His yacht, Healani, won the first Challenge Trophy on July 4, 1889. During the years that the king was an active yachting enthusiast, it was his custom to invite the skippers and crews of the competing boats to join him at his boat house following the July 4 race. He would fill the Challenge Trophy, as it was originally named, with champagne and pass it around for all to enjoy; hence the trophy’s colloquial name—the Kalakaua Cup. There is currently one entry from Hawaii: last Transpac winner, Grand Illusion, skippered by James McDowell. In 1999, 2011 and 2015, McDowell and Grand Illusion won the King Kalakaua Trophy, which is awarded to the first place overall yacht in corrected time. There will be traditional Aloha Welcoming parties as each boat crosses the finish line and a variety of celebratory events for all participants. 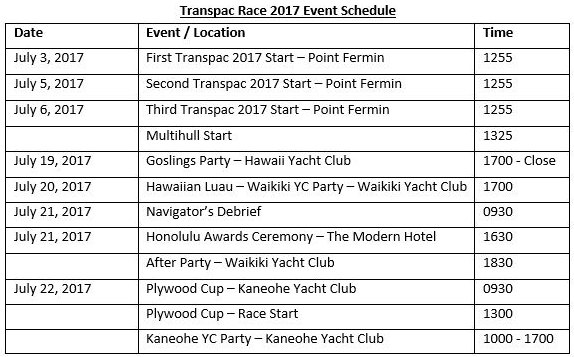 (Full Transpac Race 2017 Event Schedule below.) The prestigious King Kalakaua Cup and other trophies will be handed out at the Honolulu Awards Ceremony at The Modern Honolulu ballroom on Friday, July 21.